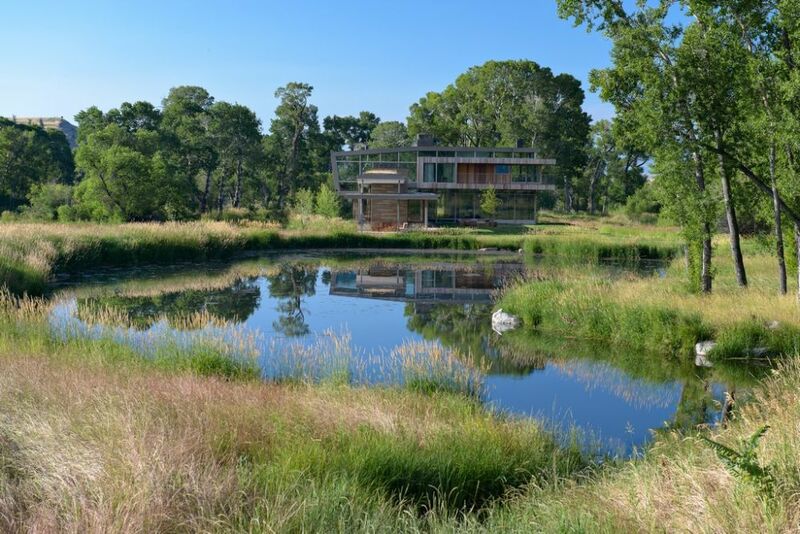 Given the opportunity, Raymond Jungles jumped at the challenge of surrounding a home far from his usual base with water and native plants. As he discusses here, making it work was about identifying a new palette and using it in ways that harmonized with his design instincts. My work as a landscape architect is usually recognized for two distinguishing characteristics – first for the inspiration I draw from my friend and mentor, the late, great Brazilian environmental artist Roberto Burle Marx, and then for my driving ambition to preserve and restore habitats, as expressed in projects throughout South Florida and across the Florida Keys and various islands in the Caribbean and the West Indies. This is why seeing the project discussed here comes as something of a surprise to many who are familiar with my work: It’s located in Big Timber, Mont., a blip on the road between Bozeman and Billings with a population of about 1,600. In terms of geography, demographics, climate, pace and personality, it’s about as far from my home base as a place can be. The obvious explanation for our participation is that we’ve worked with the client before on projects in Florida and the Caribbean and that another Florida firm, hughesumbanhowar architects of Hobe Sound, was to design the house. But there’s also my love of a challenge – and it probably didn’t hurt that the mountain range facing the property is called the Crazies and that the most prominent local landmarks are a rattlesnake den and a huge prairie-dog warren. Couldn’t pack my bags fast enough! If you dig a bit deeper into my biography, you’ll learn that, beyond Burle Marx, my primary inspiration is and has always been Mother Nature. I was influenced by childhood visits to Yosemite, Sequoia National Forest and Baja California and grew up in a Midwestern suburb that gave me access to mountains, meadows, canyons, lakes, rivers and streams – sanctuaries in which I renewed my spirits and gathered ideas. This background helps explain why I take such great satisfaction when one of my gardens in any location grows into a soft, natural-seeming, wild-yet-organized state: In these spaces, I am connected to all the experiences that have brought me to a current task at hand and am empowered to apply all that I’ve learned about keeping gardens interesting and growing in the right direction. With such a foundation, in other words, it doesn’t really matter where I work, because it’s what I encounter on site and in the site’s surroundings that drive my designs. The site was in essentially raw condition when we arrived, with sweeps of pasture cut through by rough gravel roads. The plan for the home was quite ambitious, and we did what we could to complement it. One key early decision: Keeping a large tree in place as an island in a significantly larger pond than had originally been considered. 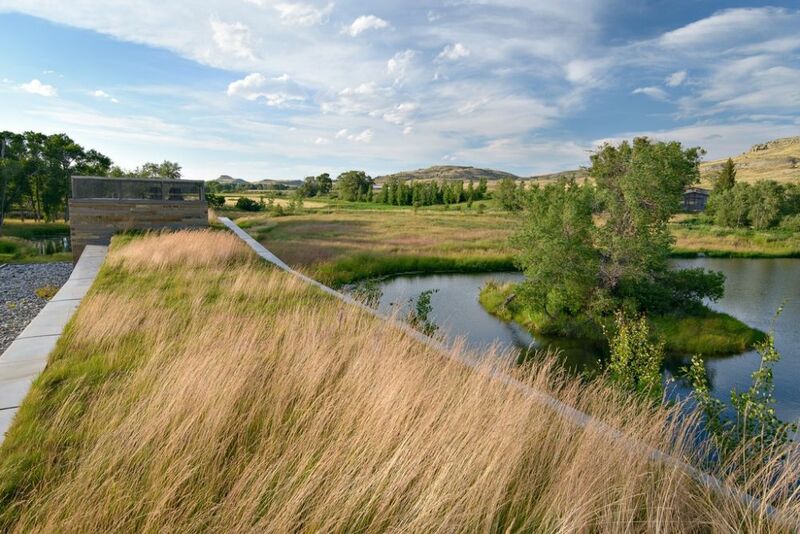 In the case of the Big Timber property, the results are about large (but subtle) gestures: As the client requested, the project embraces Montana’s expansive and dynamic skies, its undulating topography and, very specifically, a known history of water inundation. With that last point in mind, the client figured we’d be positioning the house and its surrounding environment on high ground, using a bluff looking out toward the Crazies to dodge the effects of periodic flooding. 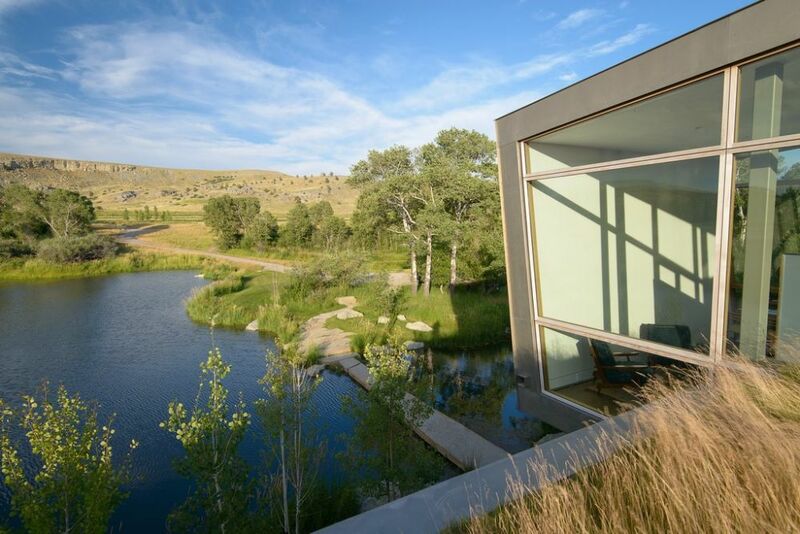 But the client had a deeper desire – that is, to tuck the house on lower ground within the river’s flood plain. This would avoid a sore-thumb, house-on-a-hill appearance, instead nestling the structure into the natural heart of the property. It would also separate the house from the property’s “working” areas and the farm/ranch structures already sited on higher ground. When we arrived, the lower site was a blank slate, and one of our main tasks was to develop the vehicular entry sequence across the farmland between the home and a well-trafficked highway. We set up a meandering, processional entrance along the periphery of the fields and substantially graded the road to lead visitors up and down and through the landscape. This path of site discovery takes strategic turns that lengthen exposure to surrounding natural highlights. On one part of the job site, the home-construction group set about placing the home up on a platform that would put it above historic flood levels. 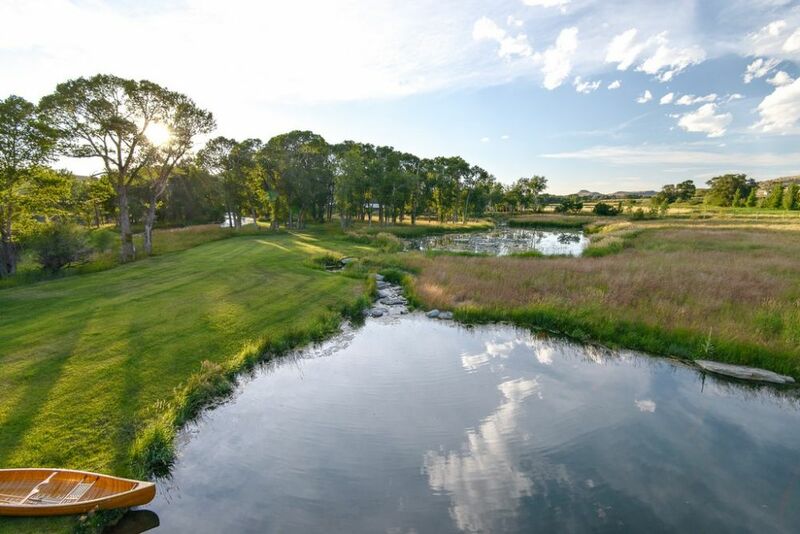 Nearby, we were digging deep into the surrounding area to shape a large pond system, complete with an island and a dramatic access bridge that would eventually lead up to the front entrance. Out of the car now and approaching the home, pedestrian transition from stone- and grass-jointed pavers to a 34-foot-long floating stone slab that rests on a steel beam/gabion system just below the pond’s surface. We placed a cascade to the left of the stone slab to activate the water and create white noise that deflects any lingering highway sound as you reach the front door. The client found a healthy supply of boulders off site; we inventoried them and, bringing them on site gradually, set about accentuating their best attributes in the design scheme. Foremost here was the placement of many of them along the pond’s edge, some for seating and others as a means to enter and exit the water. 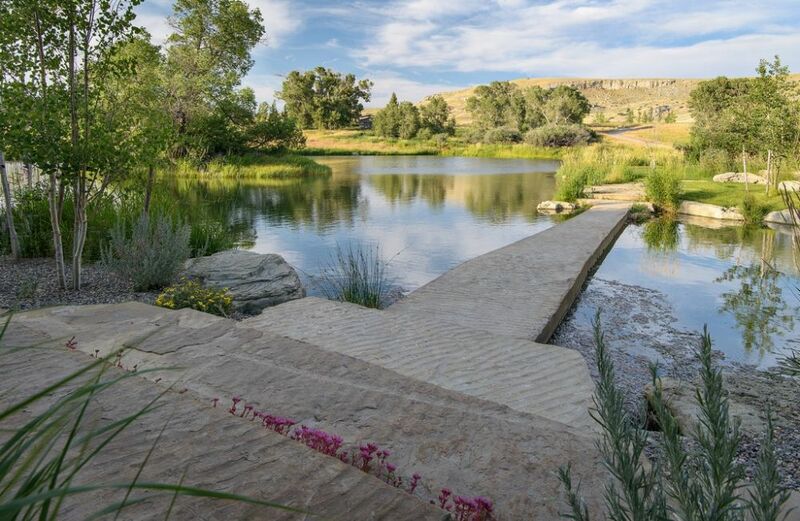 As this watershape was being dug and rocked in by a local pond consultant, however, we amended the plan to preserve an island with a lone specimen Cottonwood tree that had initially been marked for removal. The reason for the change was simple: Saving the tree gave us the opportunity to celebrate reflections of its tangled branches on the water’s surface in early morning and evening light. 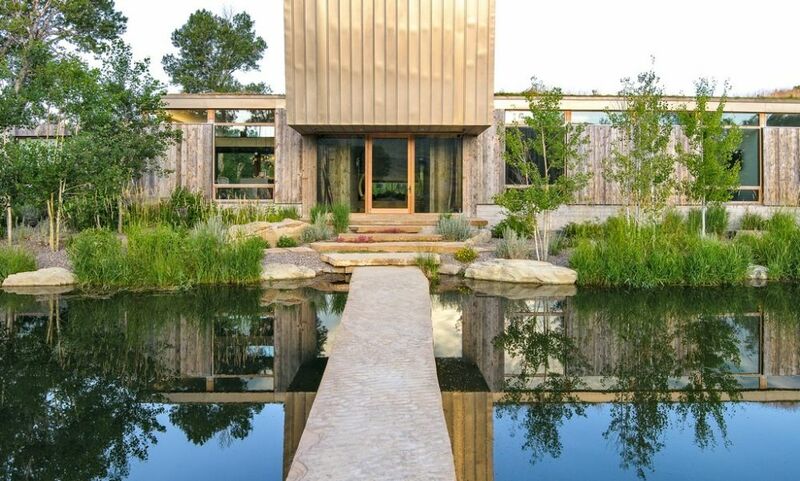 To make it work, we had to enlarge the pond – the result being that it took on an even more natural shape and scale. The client and the architect aimed at creating a home that would serve as a fun family retreat, perfect for relaxation and the enjoyment of the great outdoors. 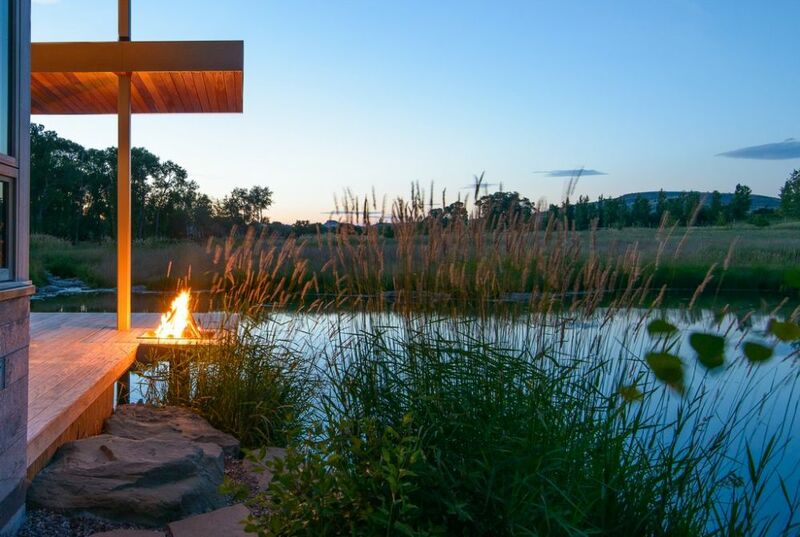 Facilitating that goal, the home plan included an elevated terrace that cantilevers out over the main pond, complete with a fire element and ample seating. Expanding on those elements, we placed stone slabs similar to (but somewhat smaller than) those the home builders used as the front entry steps, placing them on the back side of the home to create rugged, blockish terraces and pathways. Streams link the site’s multiple ponds and introduce sequences of small cascades. Plantings along the pond’s banks were installed in sod-like panels, and we regenerated all disturbed areas with native species. The meadow can be mowed down as desired, thereby suggesting a harvest-like impermanence while creating a sense of cyclical change as you move along shifting pathways. 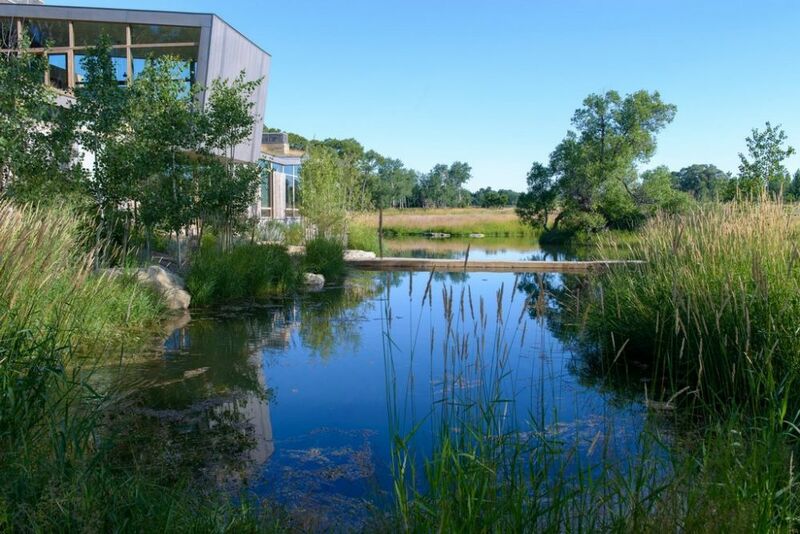 The planting palette is a celebration of local nature, with Aspen and Burr Oak trees and native shrubs selected for their interesting textures throughout the seasons. As we learned through detailed conversations with a local plant consultant – Sandi Blake of Big Timber-based Blake Nursery – many of the native grasses are slow growers and can take years to fill in. So to start things off, we planted heat-loving, drought-tolerant fescue sod that will eventually fade as the native plants establish themselves and take over. Our ambition in all of this was to mask the hand of the designer, mirror the surrounding flora and encourage habitat development by local fauna. To get things right, we worked with a landscape contractor and a nursery owner to acquire plants that would enhance the landscape both visually and ecologically. The client had taken us to visit many local gardens to see the area’s wild, native vegetation in preparation for our task of laying out a planting plan to be followed by the landscape contractor. (As it turned out, the spaces we liked most had all been designed by Sandi Blake. As adjustments were being made on site, we also added other plants to offer visual interest between growing seasons. As I see it, designing gardens is a process that’s always best done on a human scale. That’s why most of my ideas flow when I’m right there in a space, visualizing its potential and seeing how I can use what I know about design to unlock the beauty waiting there to be found. 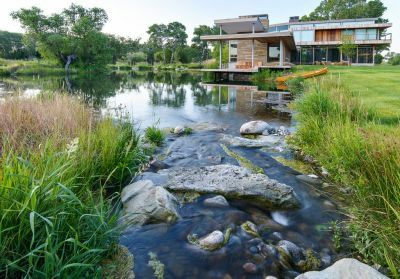 On that level, the job site really can be just about anywhere: Basic rules, practices and principles apply, and if you rely on native species, draw on local plant knowledge and identify skilled local contractors, design becomes a truly moveable feast. Generally, I’m burdened by an obsession with detail, which is why it’s so difficult for me to convey the full extent of a design on paper and I usually end up spending a huge amount of time on site. In this case, however, distance limited my ability to be there, so we had to rely on drawings to an unusual degree – and on the skill of the landscape team in following the course we’d set. 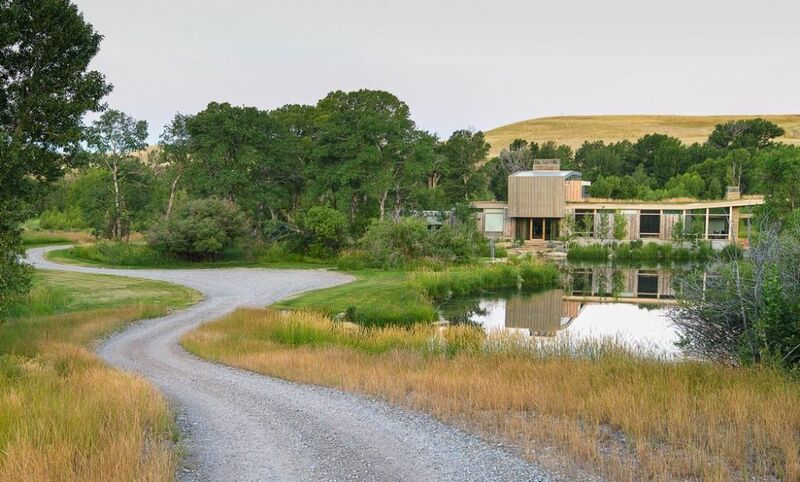 In starting this article, one of the first points I discussed almost certainly raised an eyebrow among some readers: Given the choice between placing the home on top of a bluff (where several farm- and ranch-related buildings had already been placed) or down in the flood plain, the client and the design team chose to sink the house down into the property rather than isolate it on a prominence. This isn’t the kind of choice I often get to make in South Florida, where describing most properties as “flat” is being generous. It’s also counterintuitive in places that can be described as hilly or even mountainous: There’s such a premium on exploiting expansive views across water and land that the available bluff-top placement would have been many designers’ one and only choice in Big Timber. Once the home is reached, the views out from its rooms, decks and rooftop spaces push to the horizons – a beautiful array of spaces that range from the intimate and romantic to the cosmically grand. We took a different tack. First, the higher placement would’ve exposed the home more directly to the highway and its noise to a far greater degree. Second, the existing access road to the farm/ranch facilities was long, rough and treacherous, a fact that inclined us to develop a more manageable, enjoyable approach. Third, we saw that higher placement also would have robbed the homeowners and their guests of the experience of “discovering” the hidden home along a path marked by mystery and visual rewards. Fourth, by raising the home on a well-filled pad, we effectively lifted it above the historic flood plain. 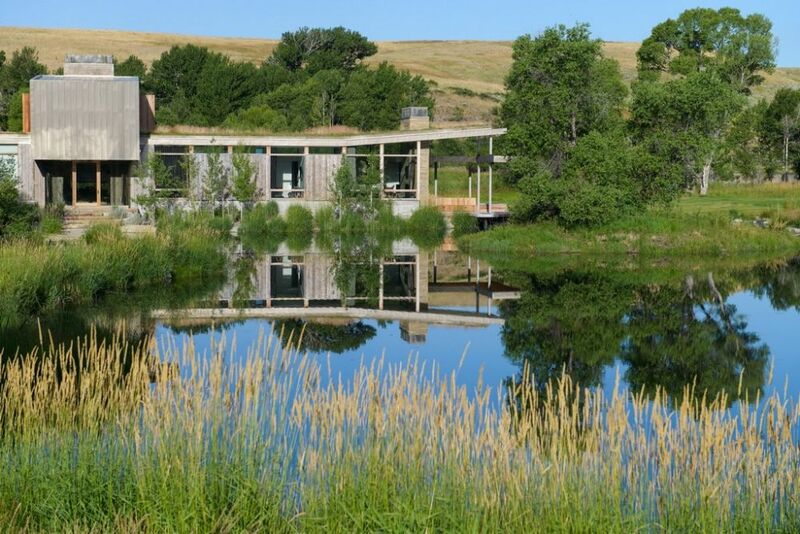 Fifth, by pushing the home down into the property, we were able to surround it with the ponds and streams and make it an integral part of the environment rather than a separate, hilltop ornament. And finally, there were the views across the stream and over the pond, taking in reflections of the Crazies in the distance. It all made sense, and the client was a willing co-conspirator. Using this approach, we took a brand-new house and a man-made set of ponds and made them seem as though they’d been there, inseparable and settled, for a long, long time.